Cinematic comfort food offering a decent holiday-themed adventure that can be enjoyed by the entire family. The Nutcracker and The Four Realms opens on a family of three children mourning the loss of their mother on Christmas Eve. Their father, Mr. Stahlbaum (Matthew Macfadyen, Pride & Prejudice, The Three Musketeers) gives each child a present from their departed mother. The eldest, Louise (Ellie Bamber, High Resolution, Nocturnal Animals) gets her mother’s favorite dress, the youngest, Fritz (Tom Sweet, Gunpowder, Ashes in the Snow), gets toy soldiers, while Claire (Mackenzie Foy) gets a locked egg that needs a special key to be opened. Distraught by the egg’s mystery and missing her mother more than ever, their father ushers them out the door to a Christmas Eve party that Claire has no interest in attending, apart from her desire to see Drosselmeyer (Morgan Freeman), an old friend of her mother’s whom she hopes will have a way of opening the key. Despite her father’s wishes for her to mingle with guests at the party, Claire sneaks away to visit with Drosselmeyer who is in the midst of a predicament. A small carousel that he presumably built is going backwards and he can’t figure out why. Despite her young age, Claire offers to assist him, demonstrating an incredible knowledge of engineering and mechanics, and with the use of a small tool, quickly fixes the carousel. However, Drosselmeyer doesn’t appear to be as helpful to Claire when she asks him for the key. Instead, she returns to the party, seemingly empty handed, until Drosselmeyer announces it’s time for all the guests to recieve their gifts. In a curious and intriguing gift giving scenario, Claire is lead by a gold rope through the mansion to another realm called Snowy Forest. Beautiful and cold, Claire notices a glowing tree ahead of her where she spots the key hanging from a branch. Just as she is about to grab it, a mouse comes seemingly out of nowhere and snatches it away. Claire chases the mouse through the snow, up and down rocks and along a river until the rodent gets away to the other side. Needing to get across, Claire spots a bridge, but is abruptly stopped by The Nutcracker, aka Phillip (Jayden Fowora-Knight, Ready Player One), who explains the bridge leads to the Fourth Realm, the most dangerous of them all, as it is at war with the other three realms. And so, begins Claire’s journey into the Four Realms with the Nutcracker at her side in a valiant effort to get the key that will open the egg her mother left her. Directed by Lasse Hallstrom (A Dog’s Purpose, Safe Haven) and Joe Johnston (Captain America: The First Avenger, October Sky), this new version of E. T. A. Hoffmann’s classic Nutcracker fable is actually two stories juxtaposed into one film. The first is the human part of the story, where we have a pre-teen girl who’s world was just turned upside down by the recent loss of her mother. Claire’s story is a basic coming-of-age tale, about how she must learn to cope with her loss while at the same time move on with her life with the little that she has left of her mother. The second is the fantastical story where Claire finds herself chasing a mouse to get her key and becomes engulfed in a different realm where toys are brought to life with a device that her mother created. This makes her a Princess in that realm, and she is the only one who can save the Four Realms from destroying each other since their Queen (Anna Madeley), her mother, passed away. 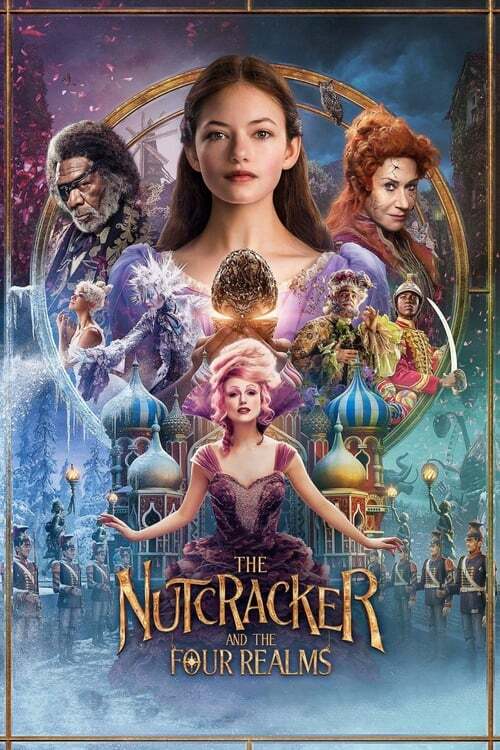 While The Nutcracker and the Four Realms makes for a seemingly interesting tale, one drawing much of its inspiration from Marius Petipa’s The Nutcracker Ballet and E. T. A. Hoffmann’s The Nutcracker and the Mouse King, neither the title nor the story actually live up to the magic, wonder and fairytale that is promised in the trailers. The role of the titular Nutcracker is a supporting one at best, and Claire spends maybe two minutes of screen time in all but one of the realms. Still, without question, The Nutcracker and the Four Realms is a beautiful movie, with the kind of old-world holiday cheer and class that old souls will definitely appreciate. But the story itself moves at a slow pace, the twists are fairly predictable for anyone over the age of ten, and there are several plot holes that are never fully addressed within the context of the film. Perhaps a deeper backstory into the realms would have given the audience answers to the questions that arose throughout the film. Aside from its incredible set pieces, stunning make up, and amazing shots, the highlights of the movie are the acting talents of Mackenzie Foy and Keira Knightly. Foy gives a stunning performance that is palpable in her every expression and gesture. Her eyes tell a story of pain, of hope, and when happy, shine an insurmountable glow that draws you into her character. Knightly was absolutely unbelievable in her role as Sugar Plum, giving a delicious performance that will leave audiences laughing and wanting more. I was a bit surprised that many of her more ‘adult’ lines were not cut, given the demographic, but these were refreshing and got the attention they deserved. The rest of the cast is a mixed bag, despite boasting an impressive pedigree. Helen Mirren played Mother Ginger, though her character largely felt one-dimensional, despite efforts made to make her into a mysterious and surprising part of the movie. Morgan Freeman, Richard E. Grant, Meera Syal and Misty Copeland also star, with a special end credit performance by Misty Copeland. Less a remake and more a re-imagining of the classic story, Disney’s updated The Nutcracker and the Four Realms offers a decent holiday-themed adventure that can be enjoyed by the entire family. Those who relate to Claire’s loss will be drawn to her character’s struggles, while fans of the original musical/ballet will be entranced by the gorgeous visuals on screen. I only wish the final product had lived up to the promise of its wildly inventive visuals and imaginative style, or retained some of the magic of the original story’s eternal fairytale. That said, those in need of cinematic comfort food this holiday season should find this Nutcracker a pleasing choice. Annette Palmer A Southern California-living soul that loves a good movie wherever she finds one. By night she's a budding screenwriter and creator of epic stories and unsung heroes. A believer in happy endings.